Hyderabad: A city court on Wednesday dismissed the bail petition of K.S. Raju, chairman of Nagarjuna group, who was arrested last week over the alleged failure of Nagarjuna Finance Ltd (originally promoted by Nagarjuna group) in repaying depositors to the tune of around Rs100 crore. The court also denied bail to P.K. Madhav, who was on the board of Nagarjuna Finance when it raised public deposits. Raju and Madhav were taken into police custody on 16 December and produced before the city court, which ordered for their judicial remand for 14 days till 29 December. “The court has dismissed the bail petitions filed by Raju and Madhav today," said B. Rajeswar Reddy, special public prosecutor, who argued on behalf of nearly 100,000 depositors who had deposited some Rs100 crore. “The court has conceded to our plea for not granting bail in view of the huge sums Raju and Madhav defaulted to depositors of Nagarjuna Finance and also keeping in view the pending investigation." Hyderabad police has also included Nimesh Kampani, chairman of JM Financial Ltd, as a co-accused in the matter as he too was on the board of Nagarjuna Finance at the time of raising the public deposits. “I don’t know why they are linking me to the company (Nagarjuna Finance) now," Kampani said. He had resigned as a director from five-six companies because “those days, the number of companies an independent director can be on board was restricted to 15 from 20". 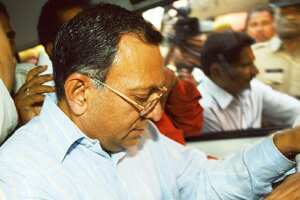 He said he had resigned as Nagarjuna Finance director in 1999. Raju has been fighting cases filed by the ministry of corporate affairs through the Registrar of Companies (RoC), which had moved the economic offences court against Raju and other directors responsible for raising public deposits. Raju claims that his group had divested its equity holding in the finance company to Mahalakshmi and the onus for repaying any deposits lies with them. RoC, on its part, says that since the management change at Nagarjuna Finance was apparently done without the consent of shareholders or depositors, the change of management— through a memorandum of understanding—cannot absolve the statutory responsibility imposed on the promoters of Nagarjuna group.